1.Material and Size: Made of high-quality Zinc alloy steel and plastic, the dimensions of the ring is 1.6 inch(4 cm), suit for most size of Smartphone. 2.Craftsmanship Awesome Image: The spinning part is between with the revolving ring and the adhesive cover，connect by the bearing, rotating ring have 3 holes above the adhesive cover in order to enjoy the inside beautiful landscape picture. 3.Multi Ability: Perfect for mobile user prop up the cellphone just hold the round ring, and good for stress people as a relieves anxiety toy when through your finger to flicking the gyro it will calm and concentrate. 4.Reusable: Durable and super strong adhesive on Smartphones and Tablets, no sticky residual after detaching, dust can be washed out using clean water to restore strong adhesiveness. 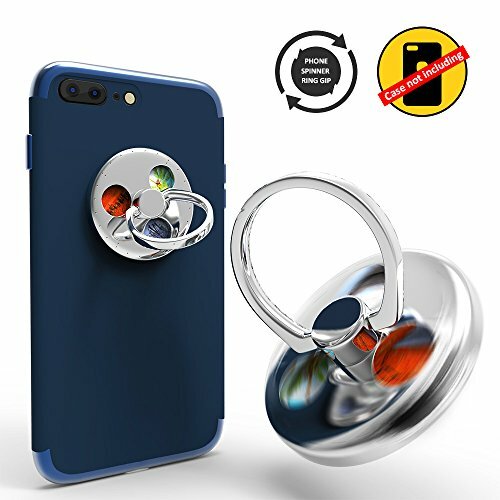 5.Special Support: Stand your cellphone up at different whatever angles, no fear of dropping phone, when you are bored with something and you can spin the rolling ring for entertainment and take relax.